The first home of the Chicago White Sox was located at 39th Street and Princeton. The 39th Street Grounds served as the playing field of the Chicago Wanderers cricket team during the 1893 World’s Fair. Charles Comiskey built a wooden grandstand on the site in 1900, serving as the home of the White Sox for up to 7,500 fans, until June 27, 1910 when the club vacated the park for White Sox Park. Charles Comiskey built White Sox Park on the corner of 35th Street and Shields Avenue. 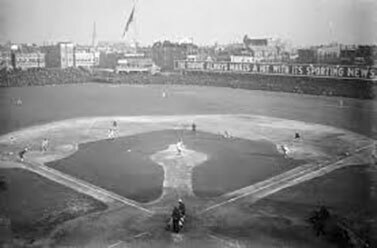 Opening on July 1, 1910, it soon became known as Comiskey Park. On August 14, 1939, the first night game in the City of Chicago was played at Comiskey Park, with the Sox defeating the St. Louis Browns by a score of 5-2. The Illinois General Assembly passed legislation in 1987 to have the Illinois Sports Facilities Authority, the current developer, owner and operator, to construct the park directly across the street from old Comiskey Park. U.S. Cellular Field would be the first new sports facility built in Chicago since Chicago Stadium opened in 1929. May 7, 1989: A groundbreaking ceremony was held with Mayor Richard M. Daley and Governor James R. Thompson in attendance. April 18, 1991: the new ballpark officially opened, with Governor Thompson throwing out the ceremonial first pitch. The new ballpark featured an exploding scoreboard, an old-time facade complete with arches and more than 40,000 unobstructed-view seats. White Sox were defeated by the Detroit Tigers 16-0. U.S. Cellular field has made an appearance in films such as Rookie of the Year (1993), Major League II (1994) and Little Big League (1994). September 13, 2002: The Rolling Stones play the first concert in stadium history. 2003 Season: Comiskey Park was renamed U.S. Cellular Field. July 15, 2003: U.S. Cellular Field hosted the Major League Baseball All-Star game. The 2016 season marks the 25th Anniversary of U.S. Cellular/ New Comiskey Park.